Normally I can’t stand those all purpose products. You know the products that are good for your hair, nails, foot fungus, slicing potatoes or whatever else the company can think of to include on the list. I like specialized treatments something specially formulated to address a specific area. Ojon just had to produce a multiuse product that I actually used in multiple ways. 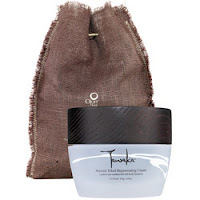 The Tawaka Rejuvenating Cream can be used on damaged skin and dry/damaged hair. It is a thick brown cocoa scented cream that works well as a body moisturizer, but I was hesitant to use it on my hair. Eventually I decided to use this cream as a pre shampoo treatment and it almost instantly made my hair soft to the touch. This sulfate free , antioxidant rich cream became a wonderful hair mask that I was certain I would use time and time again. I tried using this cream on my dry hair and it just didn’t have the same kick to it, instead my hair looked dry and felt brittle. I think it is great as a body moisturizer or a hair treatment that is going to be washed out but not as a leave in hair product. For $65 per jar I would like to see more product and less jar, the bulky container and lid take up so much space leaving the customer with much less product than necessary. The overall presentation of the product is enjoyable, your jar will be tucked into what looks like a miniature potato sack with a straw twist tie. I would not go out of my way to buy this product again but my experience with the Tawaka Rejuvenating Cream was pleasant. For $65 it needs to be doing all that and more. PJD, you are on point. I'm learning a whole new world. Great review!! $65 is a lot to pay for any product in my book, but it sounds like it was a good purchase overall. I've never tried Ojon products before, but maybe now I will -- their trial sizes at least! LOL! @BGG -Thanks..Ojon has an ultra hydrating conditioner that is packed with shea butter..I love it! Thanks so much for reading ladies. You can always to go Sephora and ask an associate to prepare a sample for you...and don't let them give you the tiny sample jar, get the largest one they have and let them fill it up. If you plan on using it for your hair you wont have enough but you can at least test it as a moisturizer.